The Kingdom of God and Home. These words together are an interesting combination. For December we thought it would be fun to join in with Christine Sine’s annual Advent synchroblog and center our December topic on the idea of “Coming Home” and how it relates to this season of advent leading up to Christmas. What does Coming Home mean to you this season? Is it practical, spiritual, emotional? What does “home” look like or feel like in the kingdom of God? 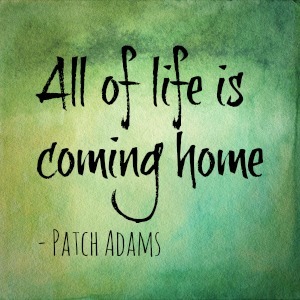 Do you have a “coming home” story that you’d love to tell? Share it on your blog on Tuesday December 17th 2013. and then put your link here in the comments section. Christine Sine’s Synchroblog will be running all of December, but we’ll still stick with our same date. We’ll post a link list on Wednesday morning December 18th, and Christine will link to it, too. All are welcome, the more the merrier! Because I’m a geek, “coming home” calls Sherlock to mind. So here’s a brief meditation on whether we can ever return to the homes of our pasts. I hope it suits. Advent Three: Redefining Home. I look forward to seeing other posts. Here is my contribution. Who I Was Made to Be.